Sweltering heat, so stifling that it could take your breath away, and there was my Mom, standing in the kitchen of our Jacksonville, Florida home. She was canning green beans she had picked from the family garden and placed in a pressure cooker that quite frankly could scare the living daylights out of you when it spouted out a steaming noise that said, “You’re done.” Mother did this task with great pride, but without benefit of an air-conditioner as she and Dad had made the decision they could do without one in order to afford and provide the other “priorities” in life they thought were best for their kids. Whatever penny they could save for their children’s braces, music and piano lessons, swimming lessons, baseball and other sports participation, the tortuous mouth gear contraptions, and extracurriculars were worth every sacrifice. In retrospect this would seem like “madness” in today’s world. One could easily go down the street to the local Winn Dixie Grocery Store, and, in a case lot sale, get 12 cans of green beans in a pallet for under 60 cents a can, making it just a little over 7 bucks! Makes you wonder why anyone with sweat that seemed the size of hailstones pouring down her face, and a fan blowing only feverishly hot air for any sort of relief, would suffer in such a “furnace of affliction.” So something more besides 8 jars of a sizzling, steamy vegetable lined up neatly on a shelf for food storage was definitely in play here. 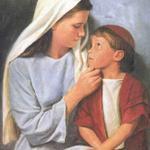 The love of a Mom is completely analogous to the love Christ extended to each of us when he died for us on the cross. 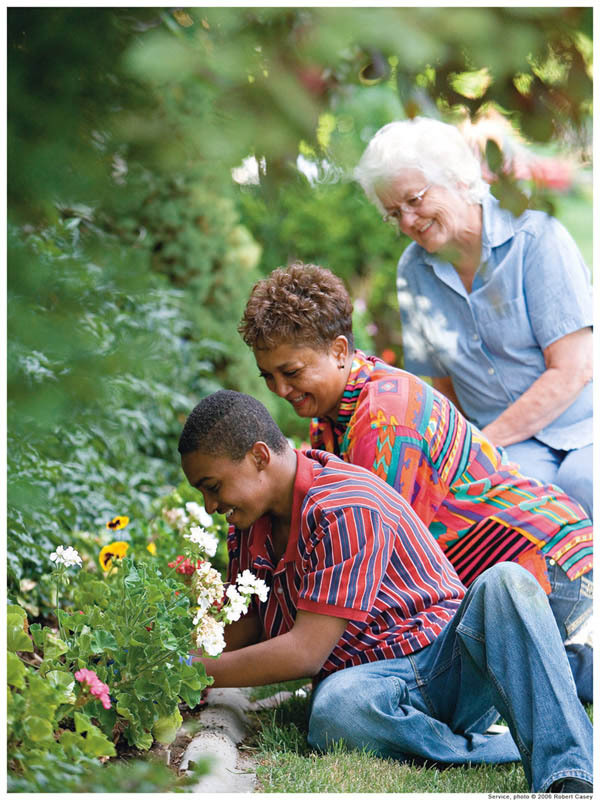 Joseph F. Smith declared it so when he stated, “The love of a true mother comes nearer to being like the love of God than any other kind of love.” And, Thomas S. Monson spoke to the level of sacrifice a mother is willing to make on behalf of her child when he gave this beautiful tribute: “Who can measure a mother’s love? Who can comprehend in its entirety the lofty role of mother? With perfect trust in God, she walks her hand into his, into the valley of the shadow of death that you and I might come forth unto life.” When my own industrious and frugal mother was canning beans on a brutally hot Florida summer day, she never uttered a word of complaint. She wasn’t thinking of, or whining about, what she would have to do without that she might have wanted for herself; she was merely saving money she surmised for a better good. It is to my sorrow that I probably didn’t tell her enough how much she was appreciated and loved. In fact, what stands out most in my mind is my own immense shortcomings in that regard. One very vivid recollection was how much trauma I felt when I saw all the other girls I started to school with in the 1st grade wear the most beautiful store-bought dresses. All I could think of was my own pitiful plight being adorned in what I considered inferior dresses my mother had sewn herself. Looking back at pictures from that stage of life, it was, in fact, the exact opposite of what I had conjured up in my faulty head–those dresses lovingly stitched by my Mom were superior in every way. Only when I became a mother myself could I see to a greater degree what a fine, selfless lady she really was. On this Mother’s Day, since my own mother has passed away, I can no longer see her face to face and tell her, “I love you Mom, and for all the good that you have done, I honor you,” but I think she knows. And to all women everywhere, mothers or not, who deem sacrifice for the nurturing love and welfare of all of Heavenly Father’s children paramount to any good they can otherwise do, I wish to convey my very deep love and admiration. Susan Porter is a guest author here today. She is a native of Jacksonville, Florida and currently lives in Great Falls, Montana. She is married to Barclay Porter and is the mother of two grown children and grandmother to two boys. She enjoys hiking, cooking, gardening, and studying religion. Susan is a retired registered nurse. 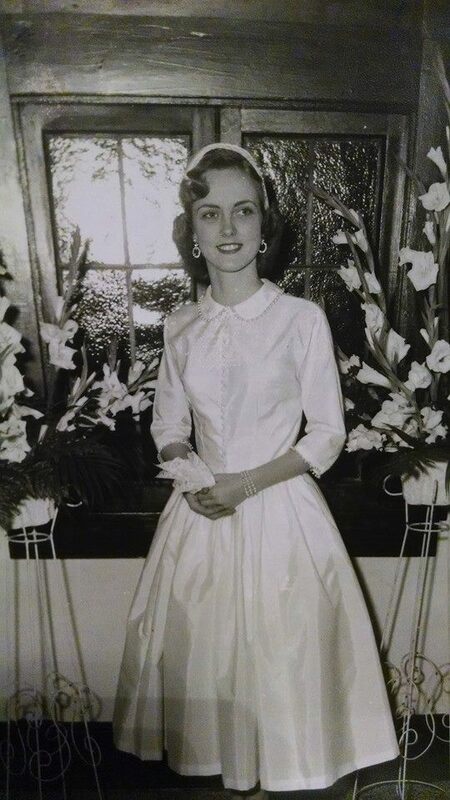 The picture of her mother in this article was taken on her mother’s wedding day. Her mother made this dress herself.